Eventitis. It’s been one of DC’s huge problems in recent years. Dan DiDio seems to be giving the DCU a terminal case of it. Sure, events have been part of larger comic universes ever since Marvel’s Secret Wars but in recent years it has gotten so bad that “status quo” is nonexistent in the DC Universe. Events used to be an annual event, something to bring readers in for the summer and promote titles people might not have known about, especially the smaller titles, or a point to create new titles. However, they were rare while nowadays DC is flooded with them. And in the case of Doomsday Clock in eternal “we’ll get it done, we promise” mode. It was more important to do one around Batman than finish the one they’re on. They’re like chain smokers now. 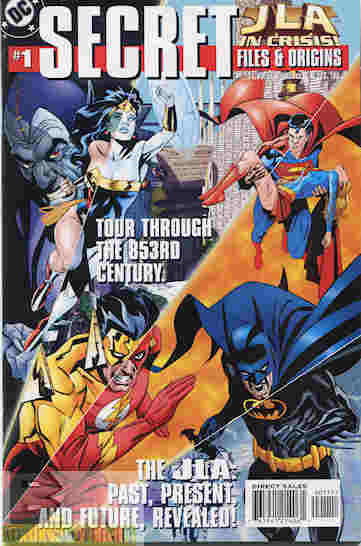 Anyway, I’m surprised a comic celebrating the various crises the DC Universe has undergone wasn’t done in DiDio’s time as editor-in-chief but in 1998. As part of our ongoing look at Secret Files & Origins (or just Secret Files depending on what page or cover you’re on), we’re up to “JLA In Crisis”, a book that came out just after the event “DC One Million“. You won’t be surprised that a story set in the 853rd century starring new incarnations of the Justice League was created by Grant Morrison if you followed comics in recent years. The Hourman of that period came back with the original…well, this version anyway…JLA, which ties into the story. I’m not sure why it’s called “One Million” though. And there is only one story this time. The usual “Lost Pages” just runs around the solar system of One Million but there is an adventure in the beginning, as the Flash starts reliving those earlier events. Good thing he gets that out of his system in this book because in the future there would be a lot more to deal with. Although since DiDio and Tom King just killed him off I guess that doesn’t matter for old Wally. White Wally’s dead because DiDio hates legacies…or at least the ones he didn’t grow up with since technically Barry Allen is a legacy Flash as well. But enough about Danny, let’s talk about something more interesting. Wasn’t there a breakfast cereal mascot with this gimmick? There is no letterer listed, even for the profile pages. For this book the profiles aren’t about characters but a short synopsis of the events. I’m just going to focus on the story. The story opens with the Hourman of the year 85,271. Instead of a guy who gets superpowers for one hour he’s the guardian of time. Not to be confused with Destiny (although they have the same tailor), Waverider, the Linear Men, Rex Hunter…there are almost as many guardians of time as there are present day superheroes, aren’t there? He’s complaining that we normal people live in the present and not past or future. My thinking is “remember the past, live in the present, plan for tomorrow”, but considering this one bit of self-advice I have trouble taking I’m probably not the motivation coach you want. Then he hears bits of recent events..sorry, Events, so you know what kind I’m referring to. Since I haven’t seen them all I can’t track down each speaker or event but Hourman tracks the source to the current Flash, Wally West. In a corner of the Watchtower Wally is not just having flashbacks to these events but one of them has turned him into a clone of Eclipso. Sensing the problem some force trying to pull Flash into the past because he can sense the “Chronozone” (like ozone I imagine), Hourman uses a “concentrated blast of present time” to attempt to undo the transformation. That last sentence makes we wonder if Peyer is Morrison’s protegé because that’s the kind of insanely awesome that strangely works I expect from either Grant Morrison or Bob Haney. Instead of working though it makes Wally flash back (no pun intended) to the events of Legends, when Darkseid had used Glorious Godfrey to turn Earth against superheroes. He sees not Hourman but a mob of anti-metahumans who must have escaped from the Marvel universe and confused “meta” and “mutant”. Flash escapes, not realizing what he’s doing in the real world, and teleports down to Earth, fittingly in front of a water fountain statue of Mercury, and splits off into 13 selves, each living a different Event. Hourman goes to the Justice League for help and since apparently explaining things is new to Hourman takes J’onn back to those events in a ghostly state. There’s this fun moment where the Justice League (roll call: Green Lantern Kyle Rayner, Wonder Woman, Martian Manhunter, Plastic Man, Zariel, and Orion…wait, Orion was in the League at this point?) go to head after him and stops short when Hourman suggests fusing the Flashes back together. What were they planning to do once they caught the various Flashes? Start a basketball team? He also explains that the problem involves the recent time traveling (like “One Million” and I would imagine Zero Hour) has done something to him via the Speed Force. Because as we see in later years the Speed Force does whatever the heck writers want it to do. While we don’t see all of the delusional Flashes we do see a few. In some polar region we see Flash dealing with his father during the events of Millennium (not to be confused with Millennium Giants, the event during the Team Superman Secret Files), when the Manhunters…you know, I read the DC Wiki explanation and I’m still not sure what happened. A version of Kid Flash keeps trying to rescue “Barry” from his death during Crisis On Infinite Earths. Just wait a few years and they’ll bring your Uncle Barry back. And kill you. And Barry’s mom for no good reason. Another, the first one Hourman finds, is creating an earthquake while reliving events of Underworld Unleashed, where Neron was playing Mephisto and offering deals like Wayne Brady, except you lose your soul so even the wins are Zonks. And so on and so on until Hourman manages to find and merge all the Flashes. Done story? No, because it really didn’t help. Hourman is an android who is tied to the timestream. While he fixed Wally’s physical problem there’s still the emotional problems cause by all this and the Speed Force/Chronosone mix is still causing visions and pain. Latching onto an earlier comment by Wonder Woman he asks about the connection between time and emotion, which causes an admittedly great line from Orion. Wait a few decades, it gets worse. Instead of having the others try to stop Wally Hourman enters Flash’s…mind I think, or whatever the time-warped Speed Force is doing to him. 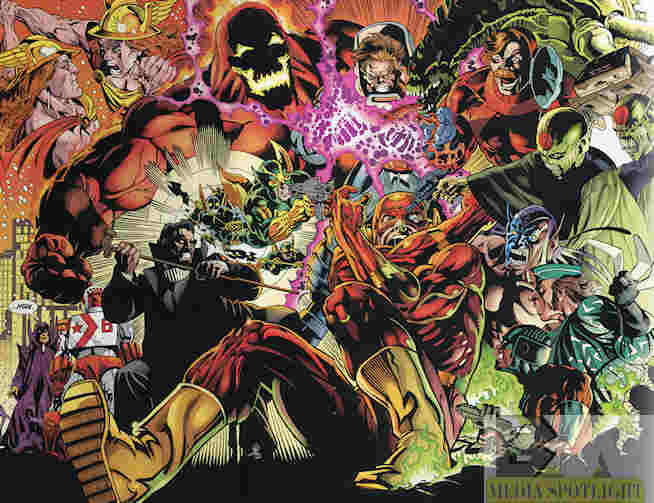 In Flash’s mind he is being attacked by all of the evils he’s fought during these annual events. Hourman tries to convince him that he can’t keep taking on the weight of all the horrors he’s seen since Barry’s death and needs to be here, in the present, which actually links back to Hourman’s own complaints earlier. Wally’s mind is restored and the Speed Force “is out of my head and back in my feet, where it belongs”. Hourman wonders if Wally will stop focusing on the past, and he admits probably not. This was a real good story on its own. It pays tribute to the various Crises (although the actual files part also brings in the Earth-Two crossovers from pre-Crisis, back when there was a multiverse before DC wiped it out for a few decades), and Wally’s part in them. Having Wally get a little bit of PTSD from his various Event encounters makes for a good story, which makes me wonder how they’d handle it now with Event after Event…oh right, they killed him off. Well, it’s a good story anyway. The “lost pages” look at the future solar system is okay and it’s nice to see a summary of events when it was still annual, before DC got a terminal case of Eventitis. However, there have been many more since then so this story is the real reason to track this book down if it isn’t overpriced. Nowadays you’d need an encyclopedia just to summaries all the events and it would be out-of-date in a month. Posted by ShadowWing Tronix on January 1, 2019 in DC Spotlight, Yesterday's Comics and tagged comic event, comic review, Crisis on Infinite Earths, DC Comics, DC Universe, Hourman (android), Justice League, Legends, Millennium, Scanning My Collection, Secret Files & Origins, The Flash, Underworld Unleashed, Wally West. Morrison’s setting of the 853rd century was one million months since Action Comics #1 and the first appearance of Superman. As good a hook as any to hang a story on, I suppose. Sounds like something Morrison would do.